My girls are back… I couldn’t be happier!!!! I do not apreciate the cover of this mini album….I mean WTF! But if the intention was to be memorable, they achieve it! The tittle track is pure f(x) magic, a perky, fun, fresh and synthesized sound. I must admit, at first I wasn’t really feeling it, but now with the MV and all I like it! I got the NA NA NA NA NA part in my head all day long haha NOW I LOVE IT…I have been electric shocked and #IREGRETNOTHING. And apparently there is a lot of people like me because f(x) is sweeping the music charts! Yaaaay!!!!!!! The MV is nice but nothing to take your breath away, I mean the girls look stunning but if you compare it to MAMA you could tell the difference in budget. As usual SM delivers an studio music video, the girls dancing and wondering around colorful backgrounds, does it sounds familiar to you? Pinocchio familiar? I have nothing against my fav girl group, I just have problems with the lack of creativity from SM! The choreo is good… could have been better? probably, but It goes with the song, I completety adore the beginning though! Check out the comeback stages here … scroll down down down!!! Romantic trip to Maldives and …well…the end of Khuntoria..cant even think of that last episode without bringing tears to my eyes!…. they were perfect together and I believe this is just the end of their ON AIR relationship! 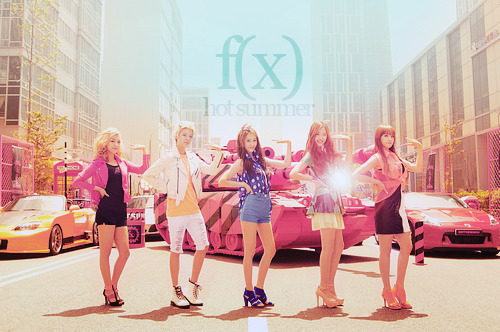 LAST WEEK my fav girl group f(x) release the MV of “HOT SUMMER”……the tittle song of their repackage album.